Being Steve Harper: Should he stay or should he go? | NUFC Blog. Being Steve Harper: Should he stay or should he go? 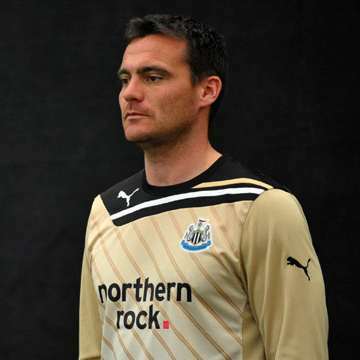 On his return from an injury picked up in pre season, Newcastle United’s most senior goalkeeper, Steve Harper, was looking forward to a return in Newcastle’s League Cup tie with Nottingham Forest. “We want to give all of them involvement. It creates competition and it gives us a different voice in the changing room. “This week, Robbie gets his chance and he and Harps will come back in, it’s important for us to keep everybody active. That may be a noble sentiment, but it’s hard to see how alternating between Harper and a lesser keeper is in the best interests of the club in the long run. Should something happen to Tim Krul in the course of a game, the club should have the best substitute ‘keeper available, and from what I have seen of Elliot, while he may be a very respectable keeper for a League One side like Charlton, I certainly know who I would choose. However, that is not really the main thrust of this piece; it is to attempt to look at this through Steve Harper’s eyes and ask, after years of service to the club, standing in the shadows of Shay Given mostly, is it finally time him to throw in the towel and move to a club that would have more respect for his undoubted abilities? After all, qualities such as loyalty and experience are very much out of fashion at the moment at Newcastle United. Jackie Milburn is dead, and Alan Shearer is on the “Match of the Day” sofa, which is much the same really. The days of “legends” spending their careers at the club is over. The emphasis has switched to a profitable turnover of younger livestock such as Krul, who can be placed in the Premiership shop window and moved on for a tidy profit should anyone take the bait. Even before this latest slap in the face from Pardew, If I were Harper, with around three or four years of my career left, I certainly wouldn’t want to wait for the day when Krul was passed on to a bigger club, only to see myself replaced by yet another younger upstart, especially so when they are simply not as good. Of course, Harper himself may feel differently, he may be resigned to being banished into the wilderness and uncomfortable with the upheaval of moving to another club after so many years on Tyneside, though he certainly could if he wanted to for one last hurrah. I lnow what I would do. He must stay at the club as new GK coach. He stayed loyal to Newcastle all these years and of course he’s a good keeper. Given could be in his place, but he sell his soul for one FA Cup… it’s sad. I thought Elliot was bought for a nominal fee to cover 3rd choice Foster while he was out on a season long loan to celtic. Elliot is not a top class keeper and is nowhere near as good or experienced as Harps. It is clear than one day Krul will take over as no.1 from Harps – are we to assume that this has now happened and Harps is on the way out? And Foster – is he not coming back? He is a better keeper than Elliot, he should take his place as no.2 to Krul. All a bit of a puzzle – but why bother to explain to the fans? I wouldn’t necessarily say that Forster is better than Elliott. Both have had stinkers for us, but it’s obvious that, if Krul is now first choice, Harper has to be the back up. I don’t know how long Harps has got left; I read somewhere that his knees and his shoulders have been giving him problems. Maybe this is his last year as a player? Maybe be retires soon and we then have Krul, Elliott and Forster as first team ‘keepers. Does anybody know how good Soderberg is? Have to admit, I was a bit baffled by the signing of Elliott, but then I’ve been pleasantly surprised by a lot of the things that have baffled me about the club lately. agreed mate – perhaps they know their jobs better than we do – its about time we were run by good coaches. I am gradualy begining to think that my criticisms are a habit caused by years of incompetance at NUFC, but I’m afraid to trust them just yet – but I live in hope. I long for the day when its proved beyond doubt that they are brilliant & right and I am crap & wrong – I will then be a happy NUFC supporter again. “sometimes mistake prone Tim Krul”…. ?…interesting observation…. “I thought Elliot was bought for a nominal fee to cover 3rd choice Foster while he was out on a season long loan to celtic. Pardew’s brought in his goalkeeping team in from Charlton supermac. He brought in his old china plate, Andy Woodman, to replace Paul Barron as goalkeeping coach. Now he’s replacing Harper and Forster with Elliot. Impatience of youth Munich. He gets caught of his line just a little too often and has been quite lucky so far this season. Though as I wrote, he is a very talented keeper. Worky, imo Krul is the best young goalkeeper in the PL, and he is one of our own, brought up through the academy, which is a tremendous achievement. I don’t see the reason for you putting put a negative angle on Krul’s ability, unless of course you prefer Harper over Krul ? I mean Harper has also made some howlers in his time. Munich, Harper is “one of our own” too. So why are you trying to “put a negative angle” (to use your words) on his abilities? Worky, I am not trying to put a negative angle on Harper’s abilities. I purely mentioned this in defence of Tim Krul, hence my comment to your article. My initial post was regarding your shot at our current number 1, excellent young Dutch international, academy goalkeeper Tim Krul, nothing more nothing less. He should stay in my opinion. But Krul reserved special mention for Woodman, with the ex-Charlton and West Ham keeper coach helping bring out the Dutchman’s fine form. He said: “Andy has played a big part in it too. Well I certainly hope that Pardew and Woodman can bring the same kind of success to Newcastle as they brought to West Ham and Charlton Munich. worky mate, don’t you ever get tired of being so negative? miracle of miracles its 3pm on a saturday! Munich, after Hitler stormed through France in a matter of weeks in the early stages of the Second World War, many Germans would have told me that I was just being negative if I said that Hitler was an incompetent crackpot, and it was inevitable that he would lose the war eventually. I probably would have been marched off to a camp too, but I would have been proved right eventually. worky….you’ve finally lost the plot big man…. Krul does still make the odd ‘schoolboy error’ like. & Harper still has a few good years left in the locker, no sweat. Harper’s been injured & has just got back to full fitness. As for Elliot, he’s had a couple of outings FFS, one a win in the cup v forest & the other a win v swans, admittedly, he’s let 6 in during those games. But we won them both & he’s just got here, give him a little bit of a chance. It’s a bit previous to right him off quite this soon, even for us. Soderberg has been loaned to Darlo for a month. Seems my ‘little theory’ is catching on. You should go round the back of SJP, crawl through an old, little-known, disused tunnel, look through a key-hole & you find that you’re looking through Steve Harper’s eyes. :lol: That’s a cracker Clint! On the “Moneyball” thing, have you ever done any research to find out how much the Oakland Athletics baseball team have benefitted from this strategy, also bearing in mind that they play a completely different game to football? Finally, don’t you think we should perhaps give Steve Harper a chance rather than chuck him for a League One keeper after all the good work he’s put in for the club in the past? Have you seen much of Elliot’s work with Charlton? Do you watch the The Football League Show, Late Kick Off etc? Worky just posted a comment but nothing up?? I’ll have a look Jamie el. Jamie el, It’s up now. Sorry about that. It’s still true Munich, despite his excellent performance today, and a good season overall so far. You’re not really interested in that though really. worky…I’m not spending so much of my time mate trying to wind up a complete stranger….;-)…. Tim Krul….academy lad, and possibly, if he sticks around, the next toon legend…. The world according to all things Toon is looking up.